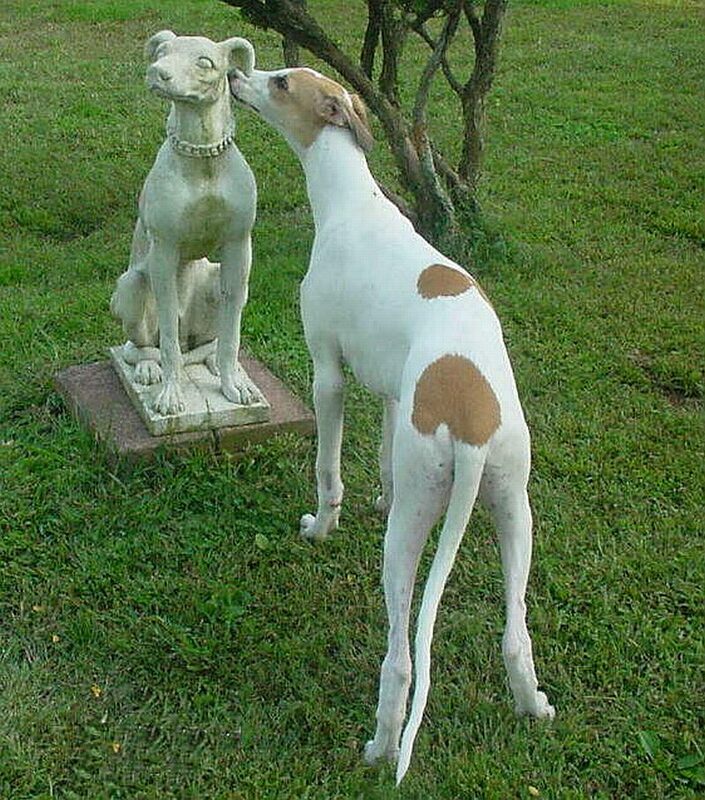 Geoffrey's calm, neutral demeanor is reassuring the lawn ornament that he means it no harm. “Whenever I’m scolding him, my dog knows he’s been bad because he hangs his head and looks guilty.” Guilty conscience? No. Good social skills. “My friend’s dog always greets us with his tail up, and is bouncy and alert. My dog always has his tail between his legs, and his ears are down. I wish he were braver.” Timid dog? No. Good social skills. “When I am in a hurry, my dog never comes when I call. He just circles around the back yard, watching and running away.” Defiant dog? No. Good social skills. The most important dog signals that we can learn are what Turid terms the calming signals. Calming signals are used to maintain a healthy social hierarchy among the pack. Dogs use calming signals to calm themselves and other dogs in the face of danger, fear, shock or stress. Most importantly, humans can also use these signals to communicate with their dogs in the face of stress or fear. Turning of the head: This calming signal can be a swift movement, holding the head to one side, a tiny movement of the head, or turning the head from side to side. It can also be as slight as moving the eyes from side to side. If your dog is approached too quickly, or head-on, it may use the head-turn signal to tell the other dog to calm down or to calm itself. If you are angry with your dog, it may hold eye contact with you briefly, and then turn its head away in an attempt to calm you down. Turning to the side: Dogs will turn sideways or turn their backs on an approaching or aggressive dog. The next time you encounter a fearful or nervous dog, turn sideways or turn backwards. More likely than not, the dog will then approach you. Graham is licking his chops here after dinner. This is not a calming signal; he's signaling that he enjoyed his meal! 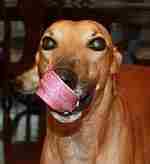 Licking: Licking the nose is a calming signal that dogs use when being approached or when approaching another dog. The movement is sometimes so quick that it is missed by the human eye. My friend has an adopted ex-racer that is a spook and skittish around new people and in new situations. While looking at the many photos I have taken of Buckaroo, I noticed that he is often captured with his tongue pasted on his nose! The act of approaching him with a huge black box in front of my face forces him to use nose-licking to calm himself. Freezing: A dog may suddenly stop all movement and stand still, lie down, or sit when a dog it perceives as more powerful approaches and starts sniffing. Have you ever called your dog and it didn’t come? As you become more annoyed (and your voice gets sharper), your dog may simply stop and stare at you. This isn’t a defiant dog! It’s a dog that senses your anger and is trying to calm you down. Sitting down: Dogs use this signal either by turning their backs and sitting down or simply sitting down when they feel stressed. Dog owners can instruct visitors to the home to sit down (on the floor or couch) if they own a dog that becomes afraid or nervous when meeting strange people. 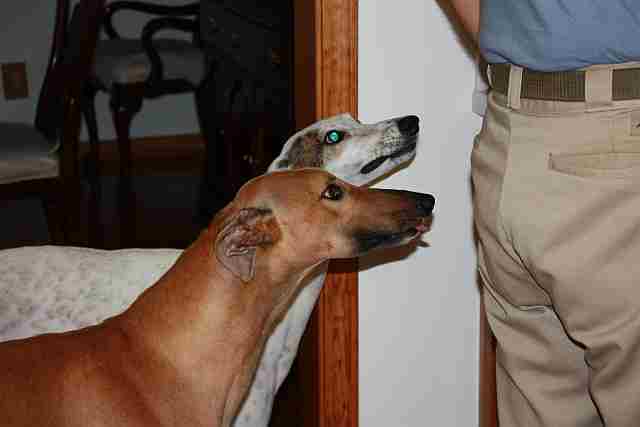 I witnessed an example of this calming signal when I was at a very large gathering of greyhounds and owners. While surrounded by three hundred people and several hundred greyhounds, my dog abruptly sat down with her back to the crowd of people and dogs, refusing to move. I thought it was endearing and even took a photograph of her in this pose. I did not understand, until afterwards, that she was coping with a very overwhelming situation and was trying to calm herself in the face of fear. Walking slowly: Movements that get slower, often so slow that there is hardly any movement at all have a soothing effect. Your dog may use this signal as soon as it sees another dog, when it senses you are angry, or when mayhem is erupting around it. Try using this signal when a dog seems frightened of you or when you do not want to scare a dog. I saw several calming signals used in conjunction at a lure coursing trial I attended recently. A greyhound that was reluctant to be re-captured was eventually leashed by the owner who slowly walked towards the dog, knelt down, turned to the side and slowly reached out to the dog when he finally approached. The owner had calmed her dog and assured him it was safe to approach. Yawning: Yawning is the human signal of boredom or fatigue. In the dog world, yawning is a calming signal. Dogs yawn when they are in stressful situations. Observe your dog for yawning the next time it is in the veterinarian’s waiting room, at an obedience class, being hugged or held tightly, or another dog is in its personal space. Sniffing: A dog may start sniffing the ground when another dog is approaching, when someone is walking straight towards him, or when you call him to come with an annoyed voice. Sniffing is the dog’s way of saying, “I am not here, please ignore me, I see and know nothing.” Try walking two strange dogs past one another. Often, one of the dogs will sniff the floor, indicating to the other that he presents no threat. Observe your own dogs or take a trip to the local dog park and you will start to see some of these calming signals in the every day interactions of dogs. Try using a calming signal when you sense your dog is stressed or nervous. When you communicate that you are calm and relaxed, your dog is likely to pick up on these cues. If you have a dog that interacts poorly with other dogs (growling, lunging, or snapping behaviours), use a calming signal, such as turning your back, or yawning, instead of the traditional leash pop or verbal reprimand. Once an aggressive behaviour has started, a reprimand is ineffective because you are making an already nervous dog more fearful and the next time this situation arises, the behaviour will likely become worse. References: On Talking Terms With Dogs: Calming Signals by Turid Rugaas (C) 1997. It is available from Legacy By Mail Inc., PO Box 794, Kula HI 96790 and Direct Book Service (1-800# here). In Canada, you can purchase the book from The Centre for Applied Canine Behaviour (613) 591-3277.